How I Got Two HTC Incredibles for Less Than $30 (and you can too)! Today was the day. 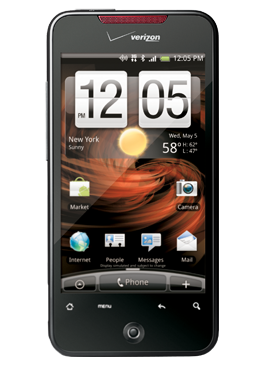 The Verizon Droid Incredible made its debut on Verizon. I went back and forth on whether or not I’d pull the proverbial trigger on this model, wait for the iPhone to make its way to the big V (after all, I’d already given up on the Google Nexus One), or jump ship to Sprint in June just in time for the HTC Evo 4G. Last Friday, after a ton of research spread out over several months, I ordered two Incredibles from the Verizon website. They arrived much to my glee and excitement – and that of my wife, it turns out – yesterday. I won’t bore you here with unboxing videos and reviews. You can get that info from a thousand other places. However, I do want to pass along some tips that will help you save some dough, especially if you’re itching for a new smartphone. First off, you surely know that if you’re at the end, or near the end of your contract with your carrier, you hold all the marbles. The leverage is yours to do with what you will. In our case that meant that, for several months now, we’ve qualified for the Verizon “new-every-two” discount ($100) as our contract expired earlier this year. If you remain patient to make sure you get just the phone you want (re: hem and haw for weeks driving your spouse crazy as you struggle with what to do), you may even get a mailer from your carrier offering you $80 off your next bill, as we did (in our case, the equivalent of one month of voice service on our, then current, main phone). Additionally, because we ordered our two Incredibles online, the rebates with Verizon were instant. No paying full price up front, filling out long forms, mailing them in and waiting the customary 6 to 8 weeks to get your money back. After this experience, I may never enter another Verizon store again (though I do need some cool accessories to trick out my phone). Minus new-every-two discount of $100 applied to Incredible #1 = Incredible #1 drops to $99 while Incredible #2 remains $199 for a total of $298. Minus One Free 3G Phone (Incredible #2) previously valued at $199 = $99 total for the two phones (Note that the free phone is the more expensive one as my new-every-two discount applies to the phone I’m actually buying). With tax, my wife and I are out less than $30. Two Incredible phones (my wife and I are loving them in the first 24 hours), and one truly incredible price, wouldn’t you agree? This isn’t hard at all, really. The trick is bringing all these separate deals together into one. None of the phone carriers present them that way, but they’re all out there, ready for the taking. Remember, do the math then make your purchase. Too often, we do it the other way around. I think that’s what’s commonly referred to as “buyer’s remorse.” I can assure you there’s none of that here. Finally, I shot a quick video with the phone’s camera yesterday. I think it looks pretty good. How about you? Nice job! And yse, the reason online/phone sales can do instant rebates is they don’t have to pay commission, sooooo sometimes it goes to the customer (and sometimes they keep it). And yeah, the incredible looks to be a fantastic phone, since I sell for Sprint i will be getting its sister phone in about a month! I assume you mean the HTC Evo 4G? Looks like a fantastic phone, Jim. I just love my new toy and I am not EVEN the tech geek like you my dear! Thank you for searching for such a great bargain! Now you know how I feel using coupons and getting great deals at the store!!!! Jeff. Very helpful post. My wife is looking for an iPhone alternative so she can stay on Verizon. Would be interested to hear how you might compare Incredible to iPhone. Worth dumping iPhone so to return to Verizon coverage? Thanks, again. I think so Matt, though I’ve never owned an iPhone. I just appreciate the ability to tinker around under the hood a little bit more. Thanks for the post and the feedback. Very helpful!